Fantasy Football Running Back Start/Sit Rankings (Week 11) - Fantasy Football, Fantasy Football Rankings | Mac Bros.
*Rankings with detailed comments will be available Friday. Any additional updates that are necessary will be posted no later than Saturday in the final Week 11 (2009) rankings. 1. 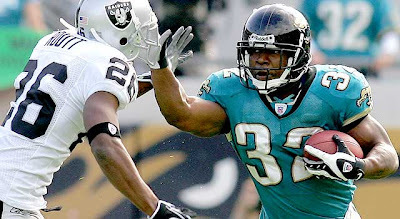 Maurice Jones-Drew (JAC) – He is coming off of a great week 10 performance against the Jets that could have been even more impressive had MJD not taken a knee at the 1 yard line to set up the Jags game winning field goal. The questionable move did not sit well with fantasy owners, but Jones-Drew should easily make up for it in week 11 against a pathetic Buffalo run defense. Not only has the Bills defense allowed an NFL worst 14 rushing TDs so far this season, they also rank dead last in the league in rushing yards allowed, giving up a whopping 173 yards per game. As you might expect, this also translates nicely into the fantasy football realm as the Bills give up more fantasy points to opposing RBs on a weekly basis than any other defense in the NFL. Jones-Drew should run wild in week 11. 2. Chris Johnson (TEN) – The last time Johnson faced the Texans back in week 2, he took them to the wood shed racking up 284 all-purpose yards and 3 TDs. While the Texans have improved significantly against the run since that game (ranking 14th in the NFL), they are still no match for the red hot Johnson in week 11. In his last 3 games, Johnson is averaging 210 all-purpose yards per game and has 6 TDs, scoring no less than 2 TDs in any of those contests. You probably can’t expect him to match his week 2 production, but Johnson could very well be in the neighborhood with the kind of momentum he is carrying into this match up. 3. Adrian Peterson (MIN) – He was able to light up the Lions in week 10 and in spite of a slightly bigger challenge against Seattle’s top 10 run defense in week 11, we expect more of the same. On paper the Seahawks have been fairly solid against the run, but in terms of fantasy, only 12 teams in the NFL have given up more production to opposing RBs. It’s also safe to say that Peterson is the best RB they have faced all season, so he should be in for a great game. Needless to say, Peterson is a must start fantasy option for week 11. CLICK HERE TO VIEW THE ENTIRE RUNNING BACK START/SIT RANKINGS.